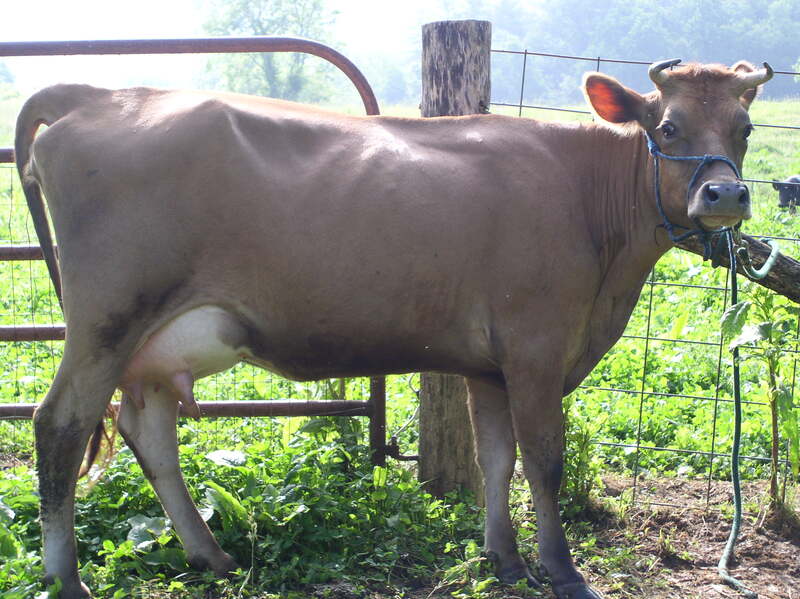 What a lovely cow little Maeby has grown into… 5 or 6 gallons a day. Are they about even, or is Pearl doing more than her half? Hand milking? Once a day milking? Calves still on? We’ve been reminded of what a great job you and your milkmaids did with her early upbringing… Just got an Angus bull calf to be raised as her consort starting next year, and he had zero handling. (And he’s older/bigger than she was when we put her in the back of the Cherokee!) Volunteering for Freezer Camp as hard as he can, the moron! Maeby is giving more than half that, and that’s twice a day milking—we sold both calves, so it sounds like Maudeuce is doing just fine! I would think an Angus, being a beef cow, would be naturally harder to handle than a Jersey! Especially a young bull. Oh, you sound so much like me! Four days and counting before Poncho, the Jersey bull goes to the processor. Yea! Yea, we may end up with more meat than we can get in the freezers. We *might* be getting two young pigs to raise and we *might* be buying a 700 to 800 pound grass fed steer to put in the freezer. Farmers Market here we come! I have been CRAVING pork. I wonder what that means. Eleven goats in milk = 11 creatures with perpetual PMS. Lovely! I share your experience with goats. Used to have a dozen of them. I love goat milk, but cows are a lot less trouble. Goats are always so discontented and whiny; the cows are ‘so placid and self contained’, to borrow from Walt Whitman. I have been hearing that Jersey bulls are surprisingly mean. Little Jangus Chuck certainly has a ‘tude. But he’s also been handled from birth, unlike the new bull, so we’re starting to like Chuck by comparison. Too bad he’s Maudeuce’s, or we’d just keep him for a bull. I’m thinking we’re gonna ring the Angus’ snout and reinforce a paddock for him, stick him in there and just let Maudeuce (and eventually the second heifer) go in to visit him when the time comes. I don’t suppose he really has to be as halter-broke and manageable as I’d originally hoped. A lot of hassle just to be sure of being able to freshen the cow(s) should AI cease to be an option. Wife said we’ll never get through all the beef if both Chuck and the new bull go to Freezer Camp… Especially since I don’t really eat anymore. I agree about goats. Entirely too capricious for my liking. Maudeuce is mischievous enough. Hello, I am interested in using this picture of Maeby for a personal memoir. The book will be given to family members, the La Jolla, CA Historical Society and the La Jolla Public Library; it will not be for sale. If it is okay, please let me know how you would like the credit to read. Thanks! Sorry for not answering sooner—your comment got shunted to my spam folder! I don’t mind if you use the picture in that application. Please credit it to Terra Mecho. Thanks!